After our stop for Italian Ice, the Death March continued through the UIC campus, and then downtown to the Loop. After brief stops to check out The Bean and Block 37 (for restrooms, and Beard Papa Cream Puffs, which have been on all three Death Marches), we walked through downtown on State Street to Chicago, and started heading west. At the beginning of the March, our Chicago host Kevin posted: “Today, friends, Richard Kaszeta, Carol Kowalski, Martin Puller and I shall embark on an event that swallows the weak: a 23-mile walk that few are expected to survive, one that challenges the gastronomic capacity of man. And there will be pie. Oh yes, there will be pie.” But here we were approaching the halfway mark on the March, and we hadn’t yet had pie. Sure, we’d already had pastries, carnitas, Italian beef sandwiches, Italian Ice, and cream puffs… but we were promised pie. Where was the pie? 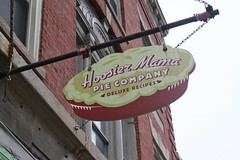 Well, after bit over a mile of westward walking on Chicago Ave, just after we passed Ashland, we arrived at the much-celebrated pie stop: Hoosier Mama Pie Company. First of all, Hoosier Mama is a small place. You could easily walk right by it. Going inside, there’s no Tardis effect here, either, the place is pretty much as packed on the inside as the outside: It’s basically a small interior space with a counter, a small refrigerated case, and three tables, one wedged into the front window. 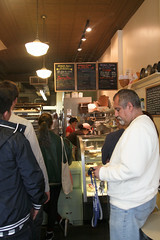 Oh, and most of the time, a line extending well out the door. In short, I wouldn’t go here expecting to get a seat at the table. Instead, you’ll probably be waiting, and have to get that pie to go. That said, we were lucky enough to arrive during a mid-day lull, and we able to grab the window seat and take a few minutes to enjoy our pies. But what they lack in space, they make up for in variety. On our visit, they had over 18 varieties of pie (12 sweet, 6 savory, and a few specials), and hadn’t yet sold out of any whole pies (although they had run out of sliced pies for some varieties), everything from your basic fruit pies, to cream pies, to chess pies, and even a handful of meat pies and quiches. But it didn’t take me long to make my selection. 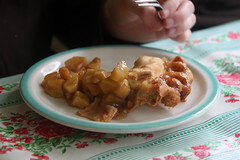 Going down the sweet pies, I started reading, “Apple pie, apple rhubarb pie, strawberry cream pie, coffee cream pie…. coffee cream pie!” This was the first time I’ve ever ordered coffee cream pie (I almost never see it on menus, and have never ordered it before), but it seemed like the perfect sort of pie for an early afternoon Death March snack. Well, it was the perfect sort of pie for an early afternoon snack. This pie had just about everything going for it. A nice flaky crust that wasn’t soggy. The cream filling was rich and flavorful, with a nice texture, real bold coffee flavors, and not an overabundance of sugar (I don’t know about anyone else, but I actually find myself disliking overly sweet things more as I get older). Top that off with real whipped cream, light and fluffy, adorned with chocolate shavings and beans, and… yum. This was, basically, a serious, serious piece of pie. If there was anything to fault about it, it was the bottom crust: Hoosier Mama appears to like to roll their crusts rather thin (all of our pies had thin crusts), and I could have used a bit more substance. 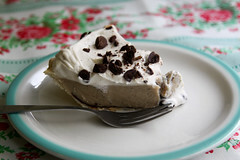 This was a quality, flakey crust (one that they had even, in the case of my coffee cream pie, applied a thin layer of chocolate to in order to minimize the filling seeping into the crust), and I quite frankly would have liked more of it. But this was otherwise excellent pie, indeed, it will remain near the top of my best pie list for some time (although those that have had a chance to sample it will confirm that Carol herself makes a damn fine pie). As for the rest of the Marchers, Carol opted for the Bourbon Chess pie, and Kevin and Martin both opted for the Apple Pie. 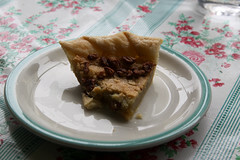 The Bourbon Chess was another example of a well-done piece of pie: the crust was good, the filling flavorful, and the overall texture having a “slightly lighter than brownie” texture called for in a good chess pie. I think Carol chose well, too..
How was the apple pie? Good enough that I couldn’t really snap a picture before Kevin had already started tucking in to his (I’m not bitter, I actually don’t like people having to wait for “Kaz and his damn camera” before eating), but he seemed to be enjoying it. As was Martin, so I think we were all in agreement that Hoosier Mama was great pie, and worth diverting a half mile off the nominal route to experience. So, was there pie? Yes, there was pie. There was pie indeed.